Octane Fitness has adapted the iconic Airdyne Pro bike for commercial use. The new Octane AirdyneX bike is ideal for functional training areas, small group training or personal training sessions. This total-body bike features a 26-blade performance fan and a responsive, single-stage belt drive, yielding virtually unlimited resistance and maximum efficiency, with the exerciser's power converted to intensity. MultiGrip handlebars provide various positions for the hands, and anti-slip foot pegs facilitate exclusive upper-body work. Whether you are performing the basic crunch, a full sit-up or a full stand-up, the X3S is sure to challenge you, regardless of fitness level. For the first time, a chair-bench combination has been created to provide a simple and effective exercise designed to deliver the most intense workout for abs, legs and core. Based on the best Cross Conditioning, MMA fighter and Pro Boxer training requirements, this simple machine delivers the best design for a complete abs, legs and core workout. Land Pride's FM25 Series Flail Mowers are built for use in vineyards, orchards and sports or recreation areas, and are available in 48-, 60-, 72- and 84-inch widths. The 80 HP gearbox is the largest in this class and will fit a wide variety of tractors. The Land Pride FM25 is sturdy and compact, featuring an electronically balanced rotor mounted on spherical roller bearings. The rotor is driven by a three-section power band belt and the spring-loaded, self-indicating belt-tensioning system makes it easy to tension belts for a longer life. The M6 Treadwall by Brewer Fitness makes cross-training easier than ever before. Climbers and fitness enthusiasts around the world have used the Treadwall for training and fun for more than two decades. Designed for fun and serious training, the Treadwall is an all-encompassing piece of fitness equipment based on 25 years of design and research into the rotating climbing wall. With its adjustable angles and speed mechanisms, the user is able to customize his or her workout to target certain muscle groups while getting a full aerobic workout. Club Car upgraded its extensive portfolio of commercial accessories with an addition to its commercial cab offerings. Engineered specifically to fit two-wheel-drive Carryall® 300, 500, 550 and 700 utility vehicles, the cab offers a series of upgrades, including ROPS certification, seatbelts, a plug-and-play wiring harness, and door locks that match the ignition system. The cab is engineered to improve comfort and reduce the risk of heat-related accidents. A tilt-out windshield, spacious sliding windows and large flip-out rear window are standard features. Helix Lateral Trainers created the category of cardio-machine-based lateral training, which moves cardio training from single to multi-plane movement. 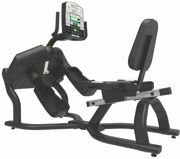 The HR3500 Recumbent Trainer brings the benefits of lateral training to a wider audience, including seniors and less conditioned users. The 360-degree bidirectional motion provides complete training of the lower body, burns more calories than traditional recumbent modalities and engages the glutes, creating lateral stability, which is important for fall prevention.